We’ve shown pop-up transfer tables in the past, like this one that is changing the orientation of a block of food. In the application described below, the pop-up transfer is used to move product between two packaging lines. The conveyor shown in this video is moving blocks of cheese. Dorner provided two lines of conveyors for this operation that moved the cheese from towers where the cheese is formed and extruded into 40 lb. blocks, to where the block is packaged and boxed. The 90-degree pop-up conveyors are located towards the ends of the lines, which run parallel to each other. 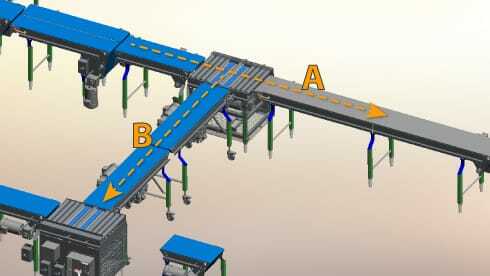 Both lines have pop-up conveyors that are connected by two conveyors running across the middle. The purpose of this set-up is to transfer the cheese in between the lines in case one of the packaging areas is down. In typical production, the cheese would continue down line (A). If production needs to switch to the second line, then the pop-up conveyor is deployed, moving the block of cheese over to the pop-up conveyor on the second line (B). 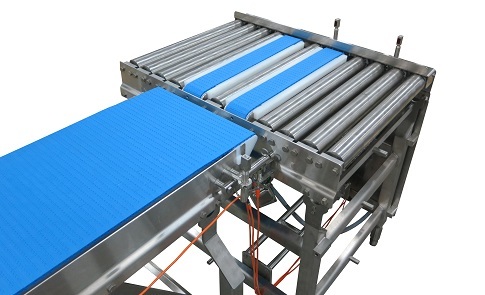 The conveyors running between the lines are on casters and attached to the pop-up conveyors with quick remove pins. This allows them to be rolled out of the way quickly to let workers or machines to pass through. Both conveyors are our AquaPruf 7400 Series Sanitary Conveyors, designed for quick and easy cleaning in washdown environments. The two conveyors running between the lines have the optional nose bar idler pulley allowing for tight transfers. Learn more about Dorner’s Engineered Solutions Group.